Red Sparrow is based on a novel by Jason Matthews, who previously worked for the CIA, so he should know a bit about the spy business. The title refers to a Russian ballerina who is trained as a "sparrow" to seduce targets, and presumably to make them open to manipulation. The novel is adapted as a screenplay by Justin Haythe (A cure for Wellness) and the movie is directed by Francis Lawrence who first came to prominence with his music videos for Beyoncé, Lady Gaga and Britney Spears to name just a few. Since Lawrence directed 3 of the 4 Hunger Games movies, it is no major surprise that he sought Jennifer Lawrence to play the title role of Red Sparrow. Despite their common surname the pair are not related, but clearly they have struck a working rapport while filming the Hunger Games movies. Similarly Francis Lawrence has frequently used the scoring services of James Newton Howard for his movies, including the Hunger Games franchise, I Am Legend & Water For Elephants. James Newton Howard has an extensive CV already. In addition to his work with Francis Lawrence, he is the composer of choice for M. Night Shyamalan, he has taken over the Fantastic Beasts franchise, he has worked with Hans Zimmer on 2 out of 3 of the Dark Knight Trilogy, and has had other major successes with the likes of Maleficent, The Bourne Legacy and Peter Jackson's King Kong. 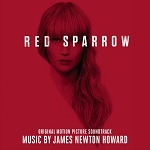 While his versatility is abundantly clear, still the overall tone of his "Red Sparrow" score seems unique in his repertoire. The "Overture" is almost 12 minutes in length starting off darkly romantic and Russian, becoming waltz-like evoking the mood of Tchaikovsky's ballet music. Although we've not yet seen the movie this must surely establish the Red Sparrow's former career in ballet not to mention the Russian setting. Following this full orchestral introduction the following tracks become sparse and minimalist with more than a touch of suspense. "Take Off Your Dress" then transitions from suspense to low-key action and back again. Within the suspense music is a figure consisting of two alternating chords immediately reminiscent of some of the scores created by Bernard Herrmann for Alfred Hitchcock's psychological thrillers. "Arriving at Sparrow School" introduces a choral element, sustained strings and low cello figures and then in "Training" the cello figures return against a ticking clock and the strings seem to morph into sound design territory. It certainly doesn't sound as though the training is easy. "Anya, Come Here" is quite low key and tense while "When Did You First Notice the Tail?" returns briefly to the Herrmannesque chords. "Blond Suits You" returns to more melodic material though its minor key is still darkly Russian sounding and "Searching Marta's Room" introduces new sound design elements blended with the ever-present strings. "Searching Nate's Appartment" and "Switching Disks" are dominated by strings in a Herrmannesque fashion though not using the 2 chords figure, with "So What Next?" in particular seeming to have a hint of Vertigo arpeggios. The penultimate track "Didn't I Do Well?" returns to a Waltz tempo which is sustained for the full duration of almost 9 minutes, and the waltz then grows and develops with chorus and counterpoint in a classical fashion. With a continuous track of this length there is a real sense of a journey taking place. The track is truly outstanding and feels like the heart of the movie, with characters dancing around their true intentions and allegiances. The "End Titles" is another long track which restates some motifs from the Overture including the main Russian theme and a return to the ballet style followed by more waltz music, before the Herrmann suspense chords get a final recapitulation. The film has very much a contemporary setting judging by the smart phones in the trailer, but it seems entirely appropriate that the music takes us back in time to Hitchcock thrillers and even Classical times. Recent events have shown that the Cold War is not simply a thing of the past, and the film's concept seems to slot into this viewpoint with ease. Howard's score is a major contributor to that mood and shows a new side to the composer. He uses a traditional orchestral sound palette with subtle touches of sound design woven inconspicuously into the fabric like an undercover spy. As a stand-alone listening experience most of the drama is in the first and final two tracks. While these last a full 29 minutes combined, the middle section of the album largely consists of suspense music. However there is enough textural variation and sonically surprising moments scattered throughout to maintain interest until the climax in the final two tracks. 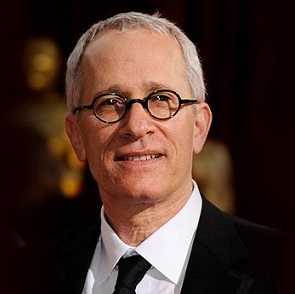 James Newton Howard has created something that's different and very welcome. Old School is a very apt description of the score, and that is not intended as a criticism. This album is highly recommended, and is available on CD and for download at the following links: Amazon.co.uk and Amazon.com.